Moving and lifting heavy materials doesn’t have to involve installing expensive equipment or permanently changing your facility. In fact, many gantry cranes are designed for quick assembly, making them ideal for deploying and redeploying outdoors or for use at multiple facilities. If you ‘re looking for flexibility for set-up site applications and repair/maintenance operations, you may just be looking for a lightweight gantry crane. Small steel gantry cranes can generally lift anywhere from ½ ton to 15 tons, and aluminum gantries can lift up to 3 tons in most cases. These lightweight lift systems are highly flexible in their overall use and management. In fact, one or two workers can push a 5-ton gantry crane under load from one part of a facility to another. 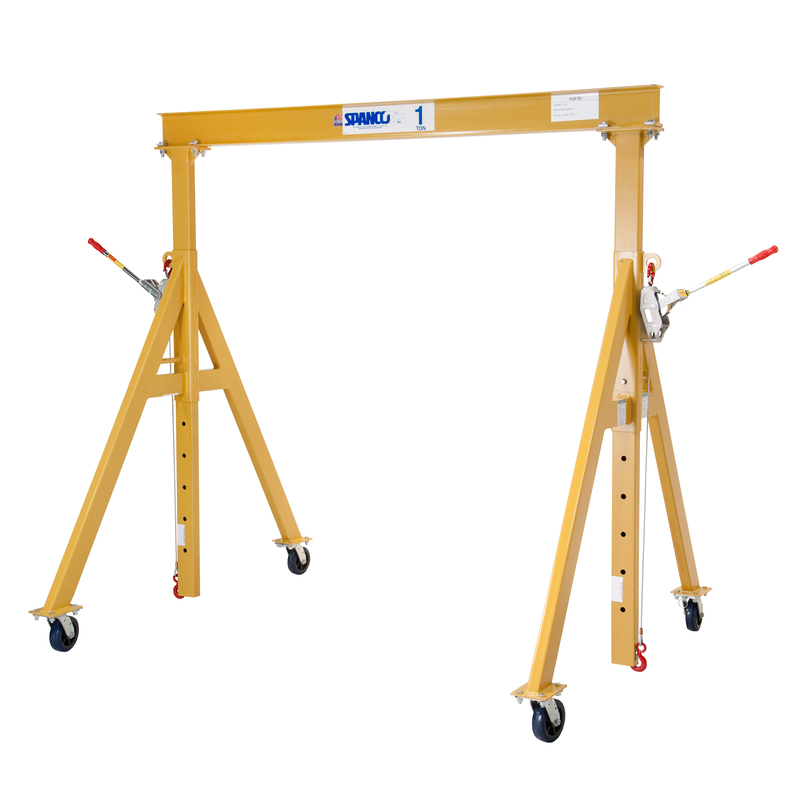 Adjustable and portable gantry cranes are easily rolled to all corners of your factory or outdoors. Gantries like these are especially useful for outdoor or soft rooftop applications because they can be equipped with pneumatic tires for easy rolling over uneven surfaces. For added versatility, many of our smaller gantry cranes are adjustable. Three-way adjustable gantry cranes offer the greatest flexibility for adjusting gantry span, height, and tread, whereas a regular A-frame gantry crane offers adjustable height and/or span and provides greater clear spans than other gantry cranes. This type of portability is essential for many set-up site manufacturers. Smaller steel and aluminum gantry cranes can be assembled, disassembled, and thrown into the back of a work truck from one job site to another. Aluminum gantry cranes offer the most portability—weighing as little as 116 pounds. Workers can move a disassembled system up stairways, onto roofs, or in other challenging locations with ease. Once they are on location, aluminum gantry cranes can be rapidly assembled and ready to lift up to 3 tons in minutes. If your application requires a heavier gantry with a longer span than an aluminum system can provide, consider investing in a three-way adjustable steel gantry crane with an aluminum I-beam. The aluminum I-beam significantly reduces gantry weight, particularly on higher-capacity systems. Aluminum gantry cranes are increasingly popular with HVAC contractors because workers can carry the systems to commercial rooftops and install or repair HVAC systems. Because they are corrosion resistant, aluminum gantries are also ideal for refrigerated areas, clean rooms, and other controlled environments. 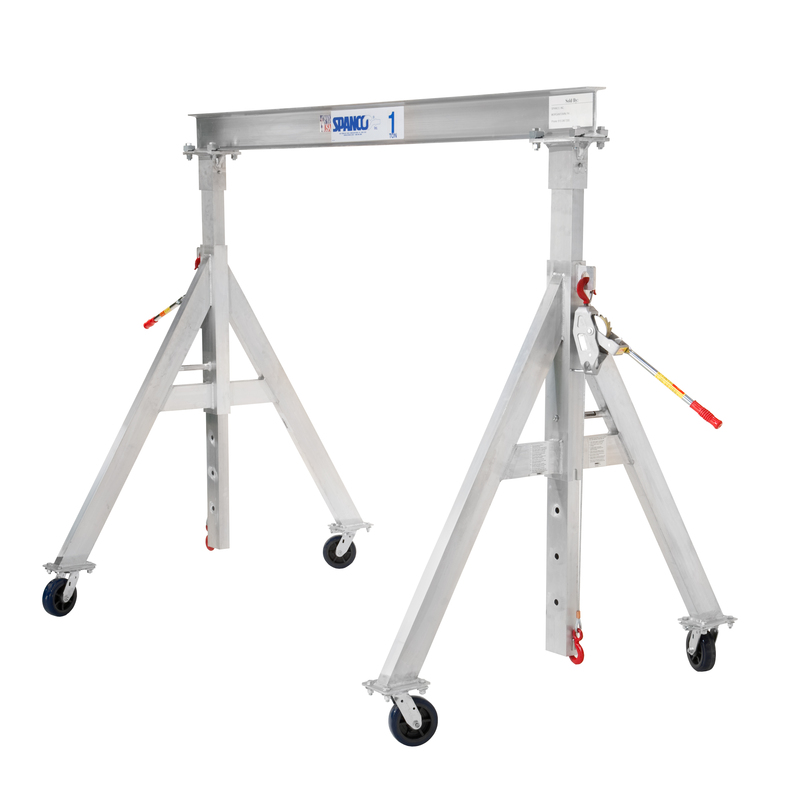 These gantry cranes are height adjustable in six-inch increments for specific lifts, uneven floors, or to move through doorways. They also have adjustable spans, which allow them to be shortened for transport down narrow aisles. Even semi-large portable frame gantries that offer high capacity, high height, and long span can be assembled and disassembled for multiple locations. These strong cranes are ideal if your building can’t support jib or large overhead cranes. They are completely self-supporting and travel directly over the floor. Portable frame gantries can lift up to 15 tons and are a perfect supplement to existing overhead cranes. They’re also useful for rented facilities because they can be easily relocated in the future. In fact, a “set-up site” manufacturer of light rail cars uses a Spanco 7.5-ton PF Gantry Crane to lift and move large drive train chassis through a long assembly process. The chassis are moved for maintenance and repair, and then fiberglass shells are mounted onto the chassis using two 10-ton Spanco T Series Adjustable Gantry Cranes. The cranes are used together with a webbing sling to lift the heavy shells onto the chassis. When they’re finished with one project, workers can simply disassemble the cranes and move them to the next location. As a set-up site manufacturer or repair/maintenance operation, this process can be laborious. But investing in the right lift equipment for your specific needs will not only improve production and efficiency, it will also cut back on down time and improve the safety of your workers. © SPANCO® Inc. All Rights Reserved.